During a typical season of the “One Room Challenge” week 6 is the final reveal. This season is anything but ordinary, the one week extension has benefitted us and taken a bit of pressure off the time constraints. Have you had a chance to check out the amazing room makeovers by a group of incredible designers during this challenge HERE? These talented professionals will wow you with their transformations. As guest participants of this challenge, we have made tremendous progress making over our kitchen the past 5 weeks, catch up here. Since last week, I have focused my attention on completing the painting of the cabinets. I have one coat remaining on these upper cabinets. The painting is time consuming, but having the right tools makes all the difference. I am using an angled brush HERE to paint the recessed areas of the cabinets. I like having a shorter handle on the paint brush, it gives me a better grip and having the angle helps me get into hard to reach areas. For the flat surfaces of the cabinets, I have been using a small roller with a woven surface HERE . The roller glides on smoothly, without leaving brush strokes. My preference for paining cabinets is to use a woven roller with a nap instead of a foam roller, the woven roller leaves a more professional appearance. I highly recommend using this primer HERE for the cabinets and 2 coats of paint HERE. Please don’t skimp on buying good paint when it comes to painting cabinets, this is the best paint out there for cabinets and it works really well! Yes it is expensive but 1 can of primer and 1 can of paint is all you need. I am painting 60 cabinets and 1 gallon of each is more than enough to complete the job. Did you notice the cabinet lighting? Accent lighting in the kitchen, inside and under the cabinets provides the perfect ambiance. When the overhead lights are off in the kitchen, the soft glow of the lights are perfect. Our “inside” cabinet lighting of choice are puck lights HERE. They are very easy to install with screws. We wired ours to a switch but can easily be operated with a remote control. “Under” cabinet lighting has come a long way over the years, remember the days when you had to hire an electrician to install cabinet lighting? Not anymore. Under cabinet lighting HERE is a simple DIY job. An added bonus of these lights – they are dimmable! We are also replacing the glass on the cabinet doors to clear glass. We will install those panes after I finish the 2nd coat of paint. Work on replacing the cabinet hardware continues. This job is taking hours to complete, going from knobs to all pulls requires careful measuring and drilling of new holes. But it’s worth the effort, the beautiful satin finish french country pulls look fabulous HERE. 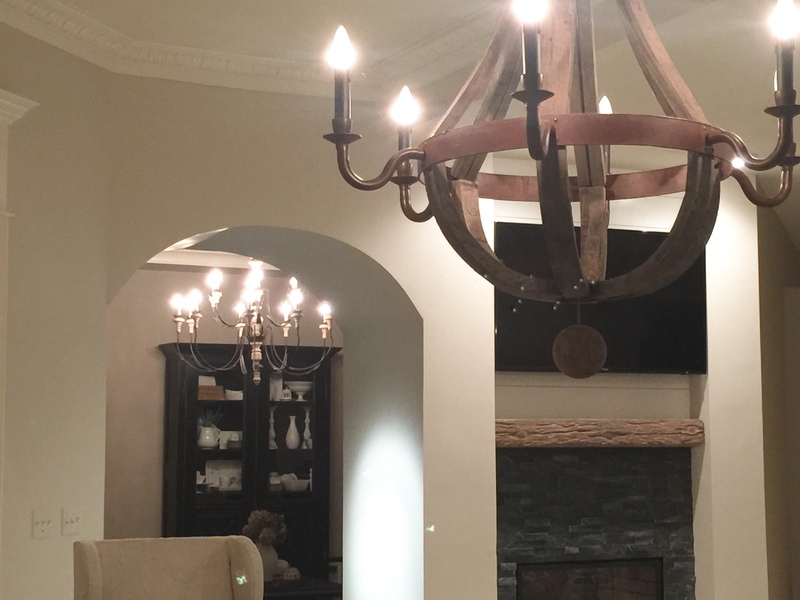 Another big project completed is our gorgeous wine barrel 5-Light Chandelier . WooHoo! This beauty is stunning! Looks awesome in the dining area of our kitchen and the soft glow of the candelabra lights is spectacular. With one week remaining, we have a few outstanding items, but I am confident we will get them completed in time for the final reveal! YAY!!! Are you as excited as I am to be done with this job?! Be sure to check back next week for the final reveal! You bet I’ll check back next week for the final reveal! It is looking great Denise! Can’t wait to see the final reveal next week! Thank You Elizabeth! I have quite a week ahead finishing up last minute tasks but anxious to see it done. Thank you Lisa! That brush is the greatest…I have a stock pile of them 🙂 Luckily, my husband is doing all the hardware installation, he has the patience and precision to do the task well. That brush is a great idea. LOVE that light fixture. Looking forward to seeing the reveal next week. Good luck in this last week. You’ve almost made it to the finish line! Thank you so much, it will be nice to have this job behind me. I can’t wait to see the final reveal! I love those countertops! Thank you! Yes the marble countertops are beautiful.